With the election being less than a week away, we can all expect to be inundated with political ads from both presidential candidates. If you can’t get enough of our current candidates, check here and here. However, for a real treat, go to livingroomcandidate.org and check out campaign ads dating back to 1952. Along with many other Red Sox die hards, I am operating at work today despite being sleep deprived and a little disappointed. I say only a little disappointed, because I’m so glad that in the end the Red Sox were able to make a series of the ALCS and not just roll over, and the truth is they just ran up against a better team. (And two World Series wins in the last four years does ease the pain). Furthermore, even though Tampa Bay had better pitching, and the Red Sox hitting wasn’t what it once was, the real blame goes to my co-worker, Bela. She admitted to me, today, that game 7 of the ALCS was the first post season game she had watched in its entirety. Clearly she’s a jinx! She does feel very bad, though. For those of you who want to drown your sorrows, we have a lot of options for feeling better about the Red Sox. Relive the 2004 and 2007 seasons with any number of books. There were several that came out, after the 86 year drought, some better than others. My favorite post 2004 books are Reversing the Curse by Dan Shaughnessy, A Tale of Two Cities by Tony Massarotti, and Mind Game: How the Boston Red Sox got Smart, won a World Series, and Created a New Blueprint for Winning by the writers of Baseball Prospectus. My favorite post 2007 book is Red Sox Rule by Michael Holley. (read my review) To read about post season heroes from 2004 and 2007, there are always players’ autobiographies, such as Deep Drive by Mike Lowell and Rob Bradford and Big Papi by David Ortiz and Tony Massarotti. I suppose you could also read Idiot by Johnny Damon, but I wouldn’t. This has nothing to do with the fact that he defected to the New York Yankees. The book, frankly, isn’t very good. 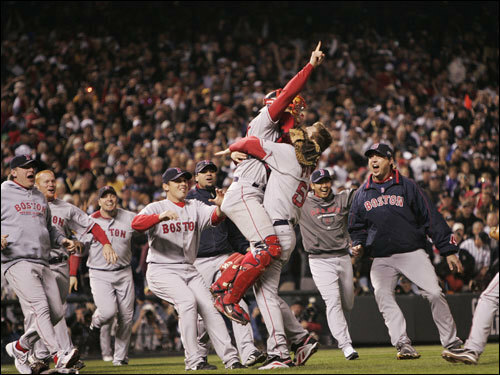 For your viewing pleasure, I recommend the NESN produced DVDs, Faith Rewarded (the 2004 teams), and Champions Again (2007). We also own the MLB produced DVDs of the respective World Series wins, but the NESN productions are a lot more fun. 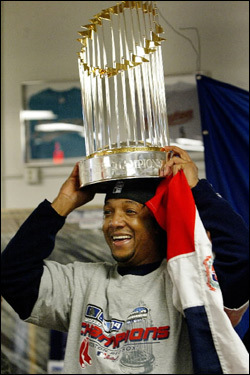 Online, relive the Boston Globe’s coverage of the 2004 and 2007 Red Sox. If you want to feel better, be sure and read any books about Red Sox history prior to 2004. You’ll remember how much pain our local nine used to cause, and you’ll appreciate everything they have done the last four years, even if it means coming one victory away from the World Series. Recommended titles are The Greatest Game : the Yankees, the Red Sox, and the Playoff of ’78 by Richard Bradley, Red Sox Century by Glenn Stout, and Shut Out by Howard Bryant. If you can stomach it, get the DVD Cowboy Up about the 2003 team, and yell at Grady Little all over again for leaving Pedro in too long. So, all is good for Boston sports fans, and remember there’s always next year! Come visit us at the library while waiting for pitchers and catchers to report. Yeah, you read that right, we now has about 50 Blu-ray movies in our collection. If you have a Blu-ray player or a PS3, come in and check out our collection (or reserve the movies online)! We expect our collection to grow in the coming weeks, months, and years, so check our catalog often to see what we have. You can see the entire list of Blu-ray movies here.